MJJT Network Monitoring Service oversees your Network performance, possible issues, provides you with real-time notifications and ensures that you may recognize warnings of Network problems. This rapid relay of information means that you can be informed of network problems whenever you may be, allowing you to instantly take corrective action and minimize potential downtime. In addition, network monitoring services eliminate the need for a physical system administrator and manual checks. This can save your company both time and money, meaning that the problem is addressed effectively. 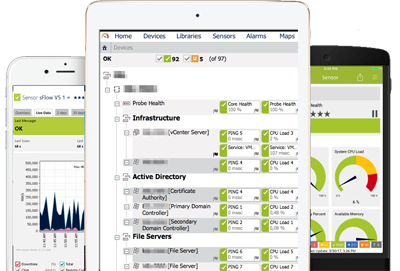 Immediate issue notification: The Network Monitoring Service can analyze performance in real-time, immediately alerting MJJT staff, optionally your own staff of any issues or failures. Network service will identify problems, allowing for corrective action to be taken quickly. Our selection of sensors allows you to check the availabilities and uptimes of your computers, servers and other devices in the system. You can choose to have any desired number of sensors that allow you to access Network situations, such as free space on disks, CPU, memory load, temperature, and bandwidth usage. Some sensors will allow you to effectively monitor Network usage and performance. Our staff can select, customize and designate sensors to match your network. Uninterrupted Productivity: Because of prompt notice of any concerns regarding your Network, further complications can be avoided because the proper action can be taken more quickly in response. As a result, business productivity and flow remain steady. Cost Efficiency: Network monitoring eliminates the need for physical staff and checking. This capitalizes on eliminating human errors, saves time, and reduces expenses. Support: Customers have the convenience of 24/7 service, web portal access, and mobile device access, OR MJJT staff managing this for you 100%.